52% cacao chocolate with truly raw cashew nuts and fruity lucuma powder. Simply delicious! 52% Cacao vegan chocolate with truly raw cashew nuts and fruity lucuma. 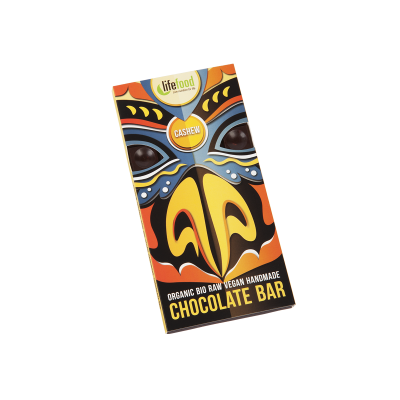 Simply delicious organic raw vegan chocolate bar where all the nutritional, mood-boosting and sensual properties of raw cacao are fully preserved. 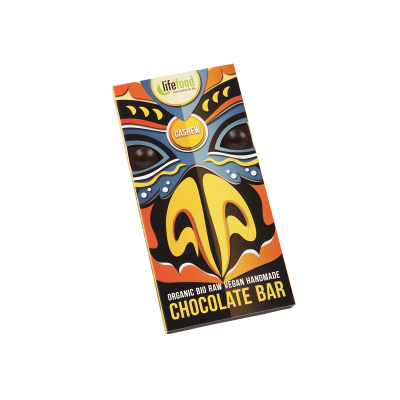 Lifefood raw vegan chocolate is an extraordinary product on the market. Silky smooth, loaded with nutrients, it is based on cacao ingredients from unroasted raw cacao beans which are certified organic. It is a live chocolate, full of nutrients, enzymes, energy and love. Raw Cacao Butter* (33 %), Truly Raw Cashew Nuts* (22 %), Raw Cacao Powder*, Raw Agave Syrup*, Lucuma Powder*, Cacao Content (53 %).